I served for seventeen years as a member of the Williams County Sheriff’s Office, hanging up my badge in 2010. I came away with seventeen years of memories, none of which I treasure more fondly than an annual detail called Cops with Kids. As a part of the program, each year in early December, my brothers and sisters of the badge would tour the Bryan Wal-Mart (or the Bryan K-Mart when it was still open) with underprivileged kids, doing some serious Christmas shopping. If I had to pick one thing that I truly missed after hanging up my badge, taking part in the Cops with Kids program would be all alone at the top of the list. The detail gave us ‘growed-up types’ an opportunity to be a kid again, while at the same time making a positive impact upon the lives of underprivileged and at-risk kids and their families. Unknown to most though, was an extensive, detailed and meticulously planned groundwork laid out prior to the day of the event. We were the most visible aspects of the event, but it was the contributions of thousands of others that made it all happen for the kids. It is behind the scenes – behind the curtain of the proverbial Wizard of Oz – that I would like to take you, because it is YOU that makes it all happen. At some point in the year, many of you receive a call from a telemarketer soliciting funds for the Captain Custar Lodge #181 of the Fraternal Order of Police. We all get annoying telemarketing and survey calls, almost on a daily basis so it would seem. The call from Lodge #181 is a horse of a different color though, because it is asking for your financial support of the Cops with Kids program. It takes a lot of money to make the program work, and the kids served are blessed that not dozens or hundreds, but thousands of you answer the call. You are a huge part of the event, donating either through the phone call, or by simply stopping by your local police departments to donate in person. Another level of donation is made by area businesses and organizations. Many of them act as ‘harvesters’, collecting donations from their employees and patrons to be contributed to the cause, and most of these businesses have been at it for a long period of time. A prime example of this can be found in the Franz Karate Budokan Dojo in Bryan. Master Steve Franz is now involved in his twelfth year of support for the Cops with Kids program, and is firm believer of its positive effects upon the kids that it serves. As he said, “It is a great program, and I will donate every year for as long as I am able…even when I can’t afford it.” The dedication of organizations and businesses like Steve’s are the other main component of funding for the operation. Prior to the big day, all the local school districts are asked to forward the names of kids that they feel are in need of a positive intervention afforded by the Cops with Kids program. Over the years, with the economy turning many a family financial situation on its head, that list has grown dramatically. Today, the number of kids served each year has reached the century mark…and it’s not slowing down. It is for that reason that the dedication of donors is so vitally important. In the days just prior to the event, a representative of the Captain Custar Lodge #181 takes the trip to the bank to withdraw the funds for the event, and even that proves special. When the big day comes to pass, the kids, with parents or guardians in tow, arrive at Wal-Mart to check in. An officer attached to Lodge #181 checks them in, gives them an official Cops with Kids tee shirt, and presents each child served with a brand new, crisp $100 bill. Many of these kids have never seen a denomination that big, and sometimes there is a look of stunned silence as they accept the money. They are then matched up with a law enforcement officer, with the target being an officer from the respective community of the child and his or her family. From there, it is a case of grab a cart and go Christmas shopping with a cop. From the perspective of the law enforcement officer, a lot can be learned about people. Yes, $100 can do a lot for a kid who has little to nothing, but spending this brief amount of time with these children as they make choices can really boost one’s faith in mankind. We are essentially there to assist, talk and provide positive companionship, but speaking from repeated experience, I can honestly say that I was amazed by these children, and for good reason. 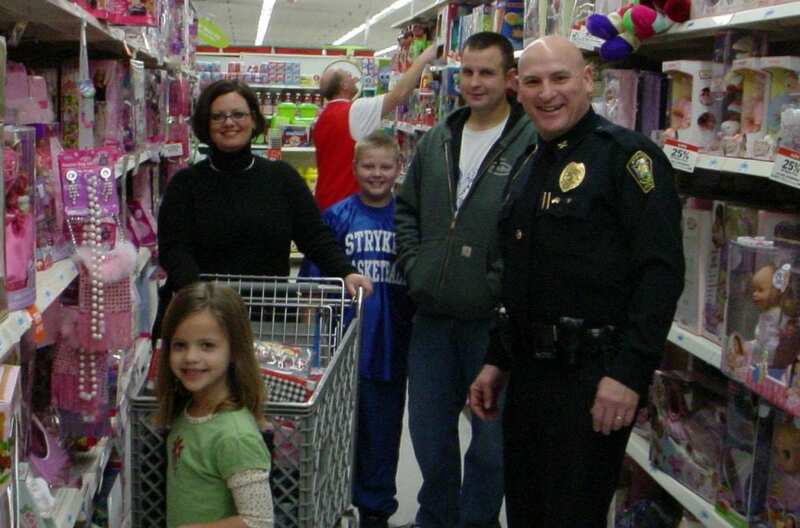 When the shopping is done, each family is accompanied by their law enforcement officer to the checkout lanes. Any change coming back stays with the kids, but the event is not over yet. The next stop is the Wesley United Methodist Church, where a pizza party of epic proportions awaits. Show me one kid that doesn’t like pizza, and I’ll show you a rainbow-striped unicorn! Tables are joined end to end from the east side of the room to the west in order to accommodate all the pizzas and drinks needed to feed 100 kids and their families (that’s a LOT of pizza). At the end of the last table on the west side sits a big Christmas tree, and an empty chair. The kids are too busy chomping pizza and bubbling with excitement of the day so far to notice the chair, but it soon becomes apparent that there is one more personality to join the kids on their special day. As the sound of sleigh bells begins to crescendo outside the room in the hallway, attention is turned to the doorway where a booming baritone voice exclaims, “Merry Christmas!” Santa Claus has arrived, and the kids are wide-eyed and beaming at his arrival. Santa tells the kids that the day was made possible by their parents, the law enforcement officers, and above all, the birth of Jesus. There is a round of applause from the families, and then a line forms for all the kids who want to have some serious talk time with the big guy from the North Pole. That empty chair is now occupied, as Santa takes on one of his most familiar of duties…talking with each child on an individual basis. As each conversation wraps up, each child receives a gift bag loaded with pounds of sweet treats. The kids make their way back to their tables, where the contents of the bag are examined with awe and excitement. That, in a nutshell, is the Cops with Kids event. As seen in the accompanying pictures from years past, the joy of the kids is contagious, but it all begins with you…answering the call from the Captain Custar Lodge #181 of the Fraternal Order of Police. These events are far from inexpensive and can run in excess of $20,000, making your contributions essential for the program to continue. Again, I ask you to look at the pictures. The event may cost $20,000, but the memories created are lifelong, and the smiles on the faces of the kids are utterly priceless. On behalf of the kids that have been served over the years…thank you! Be the first to comment on "The Cops With Kids Program: Amazing People, Doing Amazing Things For Amazing Kids"